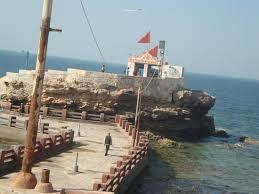 Bhadkeshwar Mahadev Mandir is on the hillock in the sea. The revered temple is behind the Geeta Mandir, in the west of Dwarka. During the high tide the temple gets surrounded by water, but at the time of ebb when the water level come backs to normal one can reach there very easily. There are steps to get into the temple. Chandra-Mouliswar Shiva is the presiding deity at the core of the temple. The deity form was found at the confluence of Gomati, Ganga and Arabian Sea by the Acharya Jagatguru Sankaracharya himself. 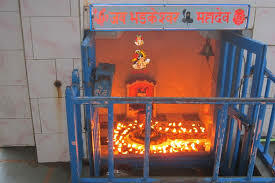 In addition, there are 1200 Salgramshilas, 1300 Shiva Lingas, metal forms of 75 Sankaracharyas. 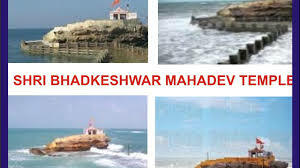 Bhadkeshwar Mahadev temple is situated on a hillock in the sea. The revered temple is located behind the Geeta Mandir towards the west of Dwarka. During the high tide the temple gets surrounded by water and the stairs get submerged, but at the time of ebb when the water level come backs to normal one can reach there very easily. 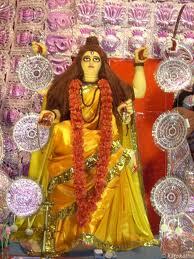 Chandra-Mouliswar Shiva is the presiding deity worshipped at the core of the temple. Acharya Jagatguru Sankaracharya himself found the deity form at the confluence of Gomati, Ganga and Arabian Sea. In addition to this there are 1200 Salgramshilas, 1300 Shiva Lingas, metal forms of 75 Sankaracharyas making it a memorable experience to get the darshan form the sea and or just watching the sea from the island. A fair takes place here on the day of Mahashivratri and thousands of devotees throng to pay respect to Lord Shiva. This small temple, 1.5km north of town, is an architectural masterpiece. Rukmini is the most important of Krishna's 16,108 wives. The temple walls are decorated with beautiful paintings depicting her pastimes with Krishna. Offshore from Okha, the island of Beyt Dwarka is associated with Lord Krishna. The main temple here, built in the 19th century, has several shrines and images of Lord Krishna and his 56 consorts. Located towards the Western Ghats of Dwarka, the amazing Gita temple is situated near the Bhadkeshwar Mahadev Mandir. The temple was built in 1970 by the leading business tycoons of India who are renowned in the world as well “Birlas”. The temple tempts to venture the ethics of the most sanctified book Bhagavad Gita. The temples at Jageshwar, in the background of Darukavana, the holy deodar forest, believed by most to house the Nagesh Jyotirlinga. Gomti is one of the most sacred bank rivers of India. It is no less than the holy river Ganaga that falls down from the heaven directly. The river itself endow various Ghats as well as shrines where devotees where the devotees perform plenty of rituals. The river could also be seen from the famous Dwarkadhish Temple. The temple is located at the same place where river Gomti meets the giant deep and blue ocean. The temple is believed to be an image of river Gomti, it is said to be brought on the land from heaven by Vasistha Muni. A river is holy in Hinduism, and the meeting place of 3 rivers-Hiran, Kapil and mythical Saraswati-with the Arabian sea, is triply important. The Triveni tirth is an important place of pilgrimage, specially to immerse ashes and pray for dear departed. world. Among these, the Temples in Jamnagar and more importantly, the Bala Hanuman Temple, Jamnagar deserve a special mention. Jamnagar, a city in the state of Gujarat is located in the Gulf of Kutch. Adinath Mandir sharp line of distinction can be drawnbetween the coastlines of Jamnagar to that of other sea coasts of India. Although the Jamnagar coastline is tidal by nature, yet they offer a few of the most spectacular beaches as well as picnic spots in the country.In addition to this, the presence of as many as 42 islands in this region makes the Gulf one of the most attractive touring destinations in India. One such destination is Rozi and Bedi Ports, Jamnagar. One of the most striking remnants of the rich past of imperial India, a Tour To Jamnagar is considered as a definite must have, if you are planning a tour schedule to Gujarat. Almost the whole of the former princely state of Jamnagar is still alive, stunning rich glory of the times gone by, standing as a witness to an era of richness which still heavily influences the way of life of not just Jamnagar but the whole of the province of Gujarat. Home to a history, which the city proudly holds even today, the long list of the various Museums Of Jamnagar are led by the exotic beauty of the museums like Lakhota Museums, Jamnagar. Transfer taxi services are available. An excellent network of state and national highways runs through the entire state of Gujarat connecting it with other Indian cities. Interstate and local buses connect Dwarka with other cities within and outside the state. Dwarka is on the state highway from Jamnagar to Dwarka. Direct buses available from Jamnagar and Ahmedabad. Dwarka municipality runs a local bus to take the pilgrims across various destinations of religious and tourist prominence. The departure timings of the bus are 8:00 & 14:00 each day while the total time of the journey is around five hours. The ticket prices are Rs. 30 for an adult and Rs. 15 for a child. Tickets can be booked near the vegetable market, which is also the starting point of the journey. Major destinations covered are Nageshwar, Gopi Talao, Bet Dwarka and Rukminimata temple. Dwarka has its own railway station which connects it to other major cities in India. Regular trains are available from nearby cities such as Jamnagar, Rajkot and Ahmedabad. The best way to reach the place is to board a train to any of the major cities around and take a train to Dwarka from there. Dwarka is a station on the Ahmedabad-Okha broad gauge railway line, with trains connecting it to Jamnagar (137 km), Rajkot (217 km) and Ahmedabad (471 km), and some trains that continue all the way down the coast through Vadodara, Surat, Mumbai, Goa, Karnataka, to the southern tip of India in Kerala. Jamnagar is the nearest airport from Dwarka while Rajkot is another option to access the place by air. Government run Indian Airlines and other private airlines such as Jet Airways and Air Deccan operate regular services to both these locations. Ahmaedabad is another major airport which is connected by regular flights from all the major Indian cities. Local transport facilities including tongas, auto rickshaws and buses are available from the main town. How did you like the information? Gokarna Lingam in shape of "Cow's Ear"
The website does not owns or claims the displayed content OR video or graphic content related to it by any means. The content displayed on the website is from internet sources. If you have any problems regarding the Url, Title of the Blog please send us message by leaving a comment on one of the post in the blog.